Want this item tomorrow, Thursday 25th April? Order within the next 3 hrs 12 mins and choose Next Day Delivery during checkout. EA7 Emporio Armani 7 Lines Logo Tracksuit In Navy Blue, A full front zip fastening and a high shine branded dark metal zipper. A large hood with an additional drawstring fastening with matte black tips with ribbed cuffs on the long sleeves and a stretch ribbed waistband. Two pouch pockets at the waist. The signature EA7 Emporio Armani logo is printed and slightly raised on the left of the chest in white with the signature 7 lines featured down the length of each sleeve in white. The jogging bottoms are in navy blue with an elasticated waistband featuring an additional drawstring fastening with matte black tips. Ribbed cuffs at the ankles with two slanted pockets on the hips and an additional pouch pocket is featured on the reverse right. The signature EA7 Emporio Armani logo is printed and slightly raised on the reverse right pocket in white and the signature 7 lines logo is featured on the lower left leg in white. 100% Cotton. 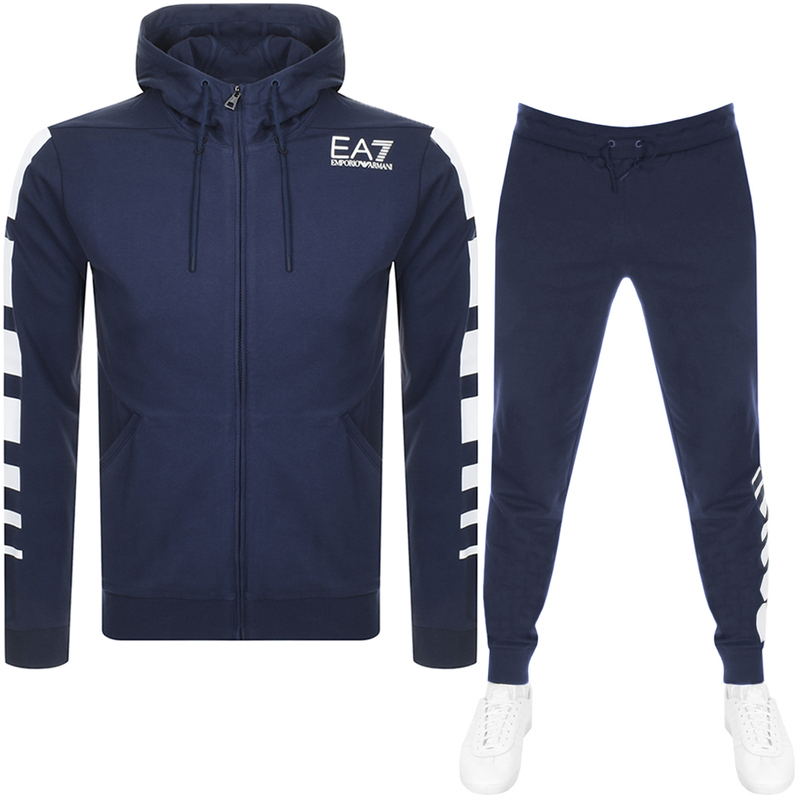 New Fresh EA7 Track Pants, Trousers And Sportswear Live Online.